We have a date!!! The recital is scheduled for Saturday, June 15th at Saddlebrook High School at 4pm. Dress rehearsal will be held at the high school on Thursday, June 13th(times to be announced). More info to follow!!! 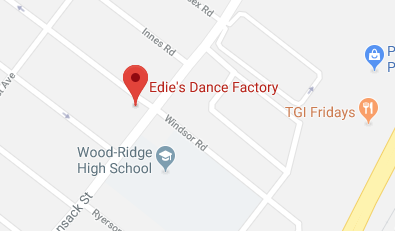 Edie’s Dance Factory is a small, family oriented, dance studio located in Wood-Ridge New Jersey. It has been a home away from home to dancers in Bergen County for over 40 years. In 1973 the studio owner and director, Edie Ollwerther, wanted to pass on to future generations, the joy of doing something you truly love. She wanted to create an atmosphere where children could develop proper dance technique, teamwork, responsibility, dedication and confidence in a structured and pleasant environment. All EDF students are given individual attention by a wonderful, caring staff of teachers. Teachers strive to make their classes a fun experience for the younger students while teaching the basics of various forms of dance. Older students are taught to strive each day to be better than they were before. They become class leaders and class assistants which allows them to learn skills to become leaders both in dance and in their daily lives. In 1992, Edie’s Dance Factory formed an award-winning competitive dance team. Students who are looking to do more than their regular dance classes are invited to be part of the team. The emphasis of this team is not winning but doing the best you can do. All EDF students participate in a benefit holiday show, a year-end recital and many local and charitable performances. This provides a student an opportunity to proudly show what they have learned. Edie’s Dance Factory hopes to continue to inspire generations of students to always follow their dreams. Enrollment is still open for the 2018-2019 season! A Bergen County New Jersey dance school for 25+ years!